Are smaller avenues of collective self-determination emerging out of the crisis? Is national citizenship still a valid organizational factor in the context of the crisis? A radical re-thinking of political citizenship, based on smaller entities such as Catalonia, Scotland or Flanders, may emerge as a reaction to growing imbalances. 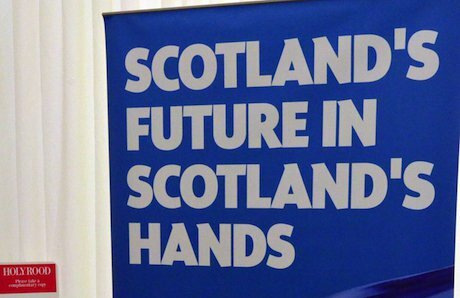 A Scottish National Party poster. Demotix/Ken Jack. All rights reserved. During the last decade strong signs of disaffection towards traditional forms of citizenship based on exclusive rights and obligations related to a national political community have emerged. The provocative point that this essay intends to make is based on one intuition by social philosopher Peter Wagner: that the financial crisis may lead to “a radical recasting of collective self-determination in different spatial terms than the nation state”. The role of civil society movements, in this context, is crucial. All the movements borne out of the crisis have supported some forms of evolution of citizenship beyond the borders of the state; but their ultimate objective has varied greatly. Few of these movements have supported the idea of larger avenues of self-determination, for instance at the European level; while most of the major civil society actors who have emerged in the last few months have engaged in a fierce defence of smaller territorial communities. This aspect represents a very fundamental way in which the financial crisis has impacted on civil society. The question is: why do most of the movements support smaller, rather than larger, spatial avenues for the determination of citizenship rights? In general, the reconstitution of avenues of collective self-determination on a larger (namely, European) level has been advocated mainly by those policy-makers who believe that the only answer to the crisis is more Europe. Some argue that the present context represents a unique possibility for a post-national European Union to emerge. This debate has brought back in the idea of a fully political union, which was postponed at Maastricht, revived after the failure of the Nice Treaty and closed with the failure of the Convention. A fully political Union would indeed go much further than its economic dimension and would be based on a much broader scope. These characteristics would, in turn, contribute to give European citizenship its full meaning and scope by taking into account the new prospects opened up by article 11 of the treaty on the European Union for citizens’ participation in the democratic life of the European Union. Eventually, European citizenship, which at the moment merely confers upon all European citizens an additional set of rights, could even replace national citizenship. Every move in this direction represents a reconstitution of collective determination into a larger avenue than the one currently in place: national citizenship. Indeed, a crisis period is a very fruitful one for bringing about these dramatic kinds of reform. At the same time, strong limits to the Europeanization of national citizenship are still present. So far, the debate has focused mainly on the political problem of compromise and willingness to pursue such a project. The establishment of a fully political Union would obviously require a very strong commitment to unity and solidarity by all the European leaders. This does not seem to be the case at the moment. However, there is another problem that could be even more important: the Europeanization of the national citizenship cannot last without the citizens' support. Although few people have focused on this aspect of the issue, an exclusively top-down construction is very likely to result in a dramatic failure, as has already happened with the project for a Constitution for Europe. Interestingly, very few of the civil society movements that have emerged in the last few months have embraced the ideal of a full Europeanization of the national citizenship. On the contrary, the crisis has accelerated calls in the opposite direction, which is civil society movements calling for a radical recasting of collective self-determination in smaller spatial terms than the nation state. In general, the crisis has brought about a dramatic loss of confidence in traditional democratic representation. This helped those nationalist parties that could turn disaffection into hate: the National Front in France and Golden Dawn in Greece, for instance. These developments also led to the defeat of incumbents and mainstream political parties. In separatist regions, instead, the same disaffection has favored parties advocating independence. In Catalonia, Scotland, South Tyrol, the Basque Country, Flanders, and many other regions, massive rallies advocating the self-defence of regional identity have flourished over the last few months. These movements have gained unprecedented media attention. They have also created broad networks involving not only political parties, but also other civil society actors who are active on the territory. Just to mention one example, at the pro-Catalan independence march that took place in Barcelona on 11 September 2012, hundreds of organizations, municipalities and institutions from all over Catalonia booked buses to bring people to the event. This involved formal organizations, NGOs, political parties, but also informal groups such as clubs of bikers and marathon runners. Generally, civil society support for the defence of smaller avenues of self-determination has been very broad. Arguably, it is easier to mobilize support for such a cause in places like Catalonia, Scotland, or Flanders, than in other places. Many of these regions never really lost their distinct identity. Here, the possibility of secession has always lingered below the surface. But only now, perhaps for the first time in recent history, independence is seen as a realistic possibility by several people in these regions. The reason why so many people are participating in these protests is connected with the impact and the opportunities created by the economic crisis. European citizens in general are shaken, skeptical and angry, and in the regions with a strong identity these sentiments are exacerbated. Civil society actors, led by political parties, have found a new way to approach independence through the economy. All these movements have in fact been cast as a very explicit form of resistance against the crisis, and also against the policies put in place both at the European and at the national level. The message conveyed by most of the major civil society actors engaged in the cause is that smaller nations could fully benefit from their natural strengths: flexibility, speed of decision-making, and the ability to clearly define national interests and strategies. At the same time, it would be misleading to cast the economic crisis as the only reason for these developments. Heather Grabbe, the Brussels director for the Open Society Institute, puts it very clearly: “the key variable for separatism is less a matter of money than of historical grievance and language. […] While economics plays a role, in the end people vote with their hearts.” Similarly, the defence of small avenues of self-determination is not only about the economy. Civil society actors in Catalonia, Scotland, Flanders and many other regions with a strong identity are supporting innovative forms of social inclusion and democratic control. These measures, that involve specific policy arrangements in matters such as residency, immigration, and social subsidies, are rather different from those put in place by the respective national governments. Arrangements of this kind challenge the assumption of many scholars, who were convinced that “national citizenship is losing ground to a more universal model of membership, anchored in deterritorialized notions of persons' rights” (Yasemin Soysal). These movements are advocating a very strong territorial form of citizenship anchored in the local community and opposed to the national idea of citizenship that is currently in place. Such a citizenship would be first and foremost territorial in its scope. It is still difficult to imagine an independent Scotland, Flanders or Catalonia; whether we will actually ever see these countries secede from their kin-states is doubtful. But what matters is that civil society in these contexts has exposed the waning sense of solidarity throughout Europe and the emergence of a deeper crisis that revolves around democratic citizenship. These developments confirm Peter Wagner’s intuition of a radical recasting of collective self-determination in spatial terms different from that of the nation state. They also show that such a recasting has gone in the direction of smaller, rather than larger avenues. This is a lesson for many policy-makers and political actors in Europe. An approach that focuses on democratic control rather than on economic benefits exclusively is crucial to understanding these forms of resistance to the current financial crisis.